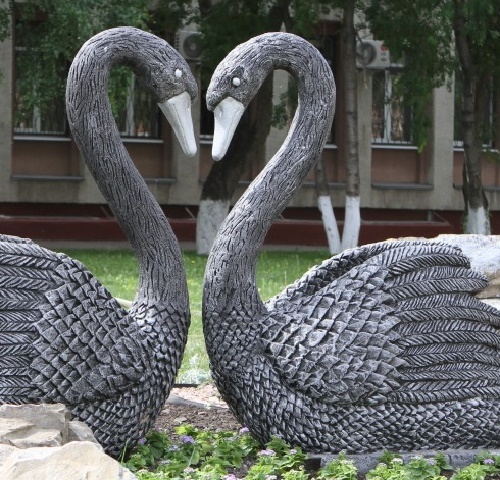 Two Black Swans monument symbolizing Miner faithfulness decorates Kirov Square in Kemerovo, the south-eastern Siberia, Russia. The sculpture is created from fiber-reinforced concrete. 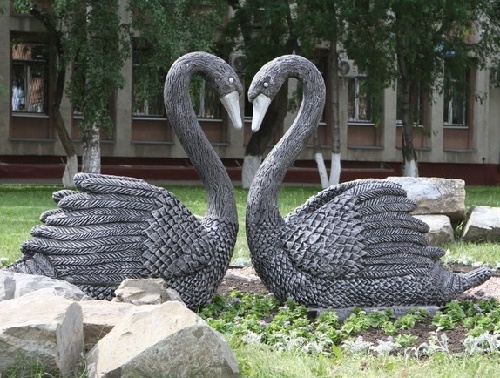 Two black swans looking at each other symbolize loyalty to miner’s profession and family. The monument to “Miner’s” loyalty appeared 8 June 2016, on the eve of the professional holiday, the Day of Miners. This annual holiday is celebrated in this coal mine region of Kuzbass on the last Sunday of August. On the Miner’s Day veterans of the miners’ work are usually given thank you notes and gifts. 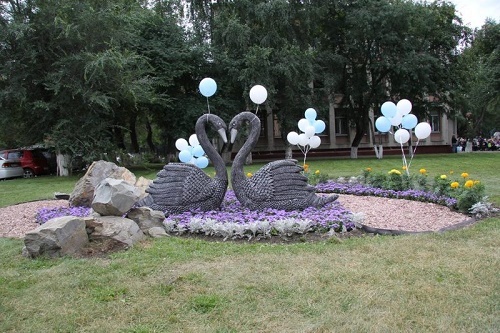 The regional administration said that the sculpture was created at the initiative of the Central area of ​​social activists – members of city competition of social and community initiatives on landscaping and gardening “City of friends – city of ideas.” The author of the composition – talented local sculptor Igor Kandrov. Around the black swans planted the flowerbed. Now there are blooming flowers. Author of the composition sculptor and artist Igor Kandrov depicted faithfulness of miners’ wives who are waiting for their beloved to return from work. Swans are the same black as miners and white beaks means love.